After, that you can go back to “Services,” choose a map service, select “Capabilities,” and you should see “Open Data Formats” as a choice to select. At that point, you should be ready to go. …and you should see be able to scroll to the bottom and see “GeoJSONServer” (which will change in a future version) as a supported extension. In the process of developing the SOE, I tested the outputs using geojsonlint.com and the OpenLayers vector format example page (see the following screen shot). I refactored my previous extension methods for the File Geodatabase API to work with ArcObjects for this SOE. The code is functional but I’d call the conversion about 75% complete. A close examination by an experienced ArcObjects developer may lead to some head-scratching as there are some artifacts from the FGDB API oriented code that I’ll be cleaning up over the next couple of weeks. The SOE is currently output-only and only supports attribute queries. I plan to work on the ability to pass in a GeoJSON geometry to do a spatial filter as well but my GeoJSON code currently only persists Esri geometries to GeoJSON but does not yet de-persist. For the sake of consistency, I don’t want to mix JSON syntax, so I want to add in de-persistence before implementing spatial filters. The SOE always transforms geometries to WGS84 for GeoJSON output. The GeoJSON spec doesn’t specifically require this; it was just my call. The SOE has been tested with ArcGIS Server 10.1 only. I don’t know if the current code will present any issues with previous versions but I really have no plans to go back and test them. The actual GeoJSON generation shouldn’t be much of an issue but I can’t speak for the SOE interface itself. Forks are welcome. As can be seen, the code is still under active development but it works in its current configuration. It’s actually performed pretty well on a very modest Amazon instance so I’m somewhat encouraged. I’ll post some issues to GitHub as a nominal road map. In a semi-related note, it looks like Marten Hogeweg of Esri is working on integrating GeoJSON support into Esri’s portal server project, so users of that tool may want to hold on for that. 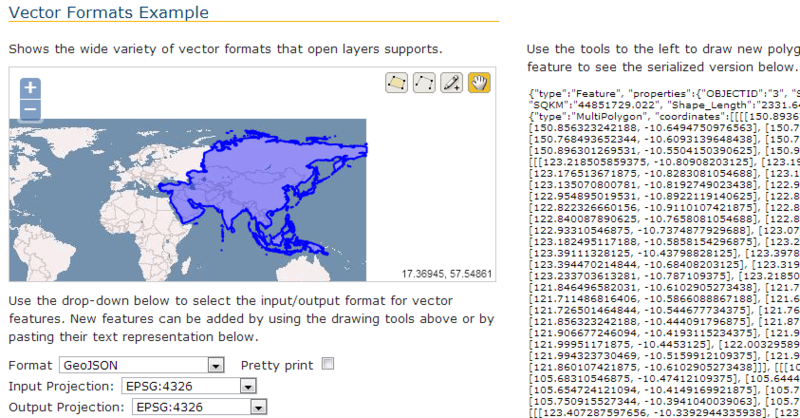 I’m looking forward to checking out Marten’s work and am glad to see Esri taking greater notice of GeoJSON. Next Next post: GeoJSON on GitHub: Now What?